And thus, the gauntlet was thrown down: Bozeman was challenged to prove they were a discerning, theater-loving community. Like most people in 19th century western America, Bozemanites liked live theater; it was a major source of entertainment and often seen as a civilizing factor as these towns moved from wilderness into modern civilization. As a fledgling settlement in the 1870s, Bozeman did not have the population to maintain its own opera house, as mining camps such as Virginia City, Helena, Butte, and other towns did. However, by 1869 the town did have access to the nearby Fort Ellis theater, two years after the fort was established to protect the citizens of Gallatin County from Indian raids. Duty at frontier forts in 19th century western America was known as boring, tedious, and difficult. Frontier posts such as Fort Laramie in Wyoming, Fort Shaw near Great Falls, and Fort Keogh near Miles City attempted to ameliorate this tedium that led to serious morale problems, including high desertion rates, by providing soldiers with libraries, theaters and drama clubs. At Fort Ellis, officers encouraged the enlisted men to participate in theater by joining an acting club. Almost from the start, a theater was built specifically for the acting club’s performances. An early Bozeman newspaper, The Pick and Plow, advertised in its first issue printed in 1869 a performance at Fort Ellis, performed by the Fort Ellis Amateurs Club. By 1873, a successor to the Amateurs Club, the Fort Ellis Dramatic Club, held daily rehearsals when soldiers weren’t in the field. Performances ranged from Shakespeare to popular plays of the time, and—towards the end of the fort’s existence—early vaudevillian-style theater. Citizens from nearby Bozeman were invited to attend, and they enthusiastically did. While the citizens of Bozeman enjoyed theater at Fort Ellis, and the Fort Ellis Acting company thoroughly enjoyed the attention of the citizens of Bozeman, the relationship between the soldiers at Fort Ellis and the townies was often strained. Bozemanites desired to achieve what their contemporaries in other Montana towns had achieved by this time: their own opera houses such as the Ming Opera House in Helena, McGuire’s Opera House in Butte, as well as a spot on the touring circuit of the famous and respected traveling theater companies led by well-known itinerant actors such as Jack Langrishe, Frederick Warde, Daniel Bandmann, and Helena Modjeska. Despite the occasional performances in Bozeman by famous 19th century actors in venues as diverse as meeting halls and saloons, no official theater had yet been built by the time Fort Ellis was closed at the end of the Indian wars. By 1887, Bozeman mayor John Bogert (after whom Bogert Park is named), who loved theater and the arts, led the town in a successful effort to fund and build a combination city hall and opera house. In 1890, Bozeman’s first Opera House became a reality. As part of the new city hall, built on the corner of Rouse and Main Street, the theater shared the building with the fire department, police department, city offices, and a jail. Musicals, dramas, comedies, and vaudeville productions made regular appearances in the 900-seat auditorium upstairs. Famous performers of the late 19th and early 20th century often played on the Bozeman Opera House stage. Today, the site of the Bozeman Opera House is a city park, adjoining the Eagles Club. The Ellen Theater, named after Nelson Story’s wife Ellen, opened to the public in 1919, and was quickly filled with live drama, vaudeville, music acts, and motion pictures. Famous actors including Edgar Bergen and Vivian Vance performed in The Ellen. As vaudeville slowly died, The Ellen became devoted to film, and the voice of live dramatic productions was stilled on The Ellen stage. The transition from live theater to film can be illustrated by Percy Hurst, manager of the newly opened Rialto Theater. 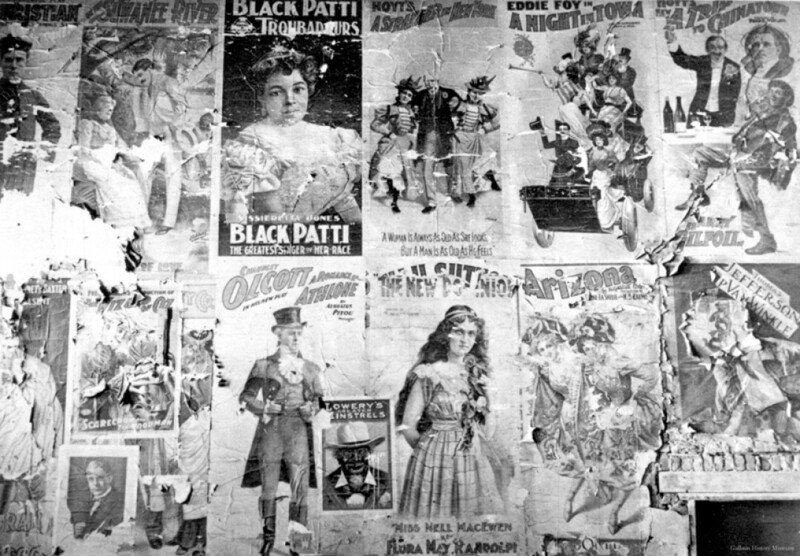 In 1922, Hurst leased the Bozeman Opera House to provide a mixture of traveling vaudeville productions interspersed with motion pictures, eventually focusing only on motion pictures showing at the Rialto. 1950 saw an interesting rebirth of live theater with a Lewis and Clark pageant, celebrating the 145th anniversary of the famous Lewis and Clark expedition that traveled through Gallatin County. This pageant was recreated in 1988 and 1989 based upon the script written for the 1950 pageant. 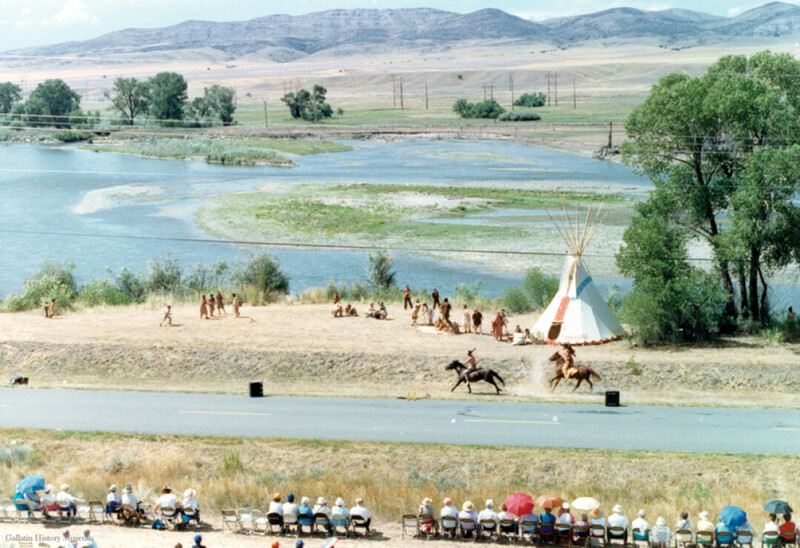 The pageant performed on-location at Headwaters State Park, and involved Lewis, Clark, Sacagawea, and the other men of the expedition floating down the Jefferson River in canoes, carrying on a conversation through loudspeakers mounted on the riverbanks to the audience sprawled out along the riverbank. York was played by a black student from Helena, Sacagawea was played by a teenage Navajo girl. Lewis and Clark, along with the rest of the 150-member cast, were portrayed by Bozeman dignitaries and townspeople. The audience of 2,500 people watched and listened as the expedition landed on the shore near a Shoshone village which happened to be the village of Sacagawea’s brother, the chief of the village—a fortuitous meeting that saved the Lewis and Clark expedition. Entranced by a similar allure for using Montana’s natural landscapes as a backdrop for theater, Montana State University professor of drama Bruce Jacobsen began performing scenes from several Shakespeare plays in Bozeman and surrounding towns in 1973. Today, 45 years later, Shakespeare in the Parks continues to perform Shakespeare and other classic theater. While Shakespeare in the Parks was taking off, MSU’s drama classes discovered a Bozeman passion for theater. On the western end of Main Street was the old “Kirk Farmstead,” which consisted of the original farmstead barn, built in 1900. By the 1970s, Bozeman had grown west far enough to enclose this Kirk Farmstead and its Red Barn within the city limits. The Drama department found a way to turn this barn into a theater, and for a few years, performed plays in the barn. Today the Red Barn still exists; having once upon a time hosted cows, horses, actors, and chefs, today it is a restaurant known as Feast. Many of the actors you may see on the Bozeman stages today fondly recall their days on the Red Barn stage. A descendant of the Kirk family that built the Red Barn, Chris Harris, recently wrote a play called “Grasshopper Wings,” set in 1928, using local names, places, and some history of that era. It’s a musical farce, resembling the kind of plays popular in 1890s Bozeman. Harris hopes to bring this play to life on a local stage, connecting the halcyon days of 19th century live theater to the 21st century stage. Today, live theater is flourishing in Bozeman and the surrounding area. Acting companies and theaters include Bozeman Actors Theatre, Shakespeare in the Parks, Open Door, The Ellen, Montana Theater Works, The Verge, Kaleidoscope Theater, Children’s Shakespeare Society, Intermountain Opera Company, MSU’s drama class, and high school plays. A sample of Bozeman’s busy theater schedule for January and February of 2019 features the following: Shakespeare in the Parks’ Noises Off; Bozeman Actors Theatre’s A Moon for the Misbegotten; The Verge’s Fun Home; Intermountain Opera’s Camelot. While the Bozeman Opera House is gone, The Ellen and the Rialto once more ring to the sounds of applause following live performances as in the days of old, giving voice again to Shakespeare, George Bernard Shaw, Henrik Ibsen, as well as playwrights of the 20th and 21st centuries. Looking back to 1885, it seems that the Bozeman Weekly Chronicle’s faith in Bozeman’s appreciation of live theater has been justified. No longer do Bozeman citizens need to rush out of town to see quality theater or wait for itinerant performers to come to town; today these actors are living –and performing—in our midst, inheritors of Bozeman’s desires of 150 years ago.